West Bromwich Albion came from behind at Swansea City to earn a third straight Championship win. The hosts started strongly and led as Oli McBurnie struck on the rebound, only for Craig Dawson to head the Baggies level two minutes later. Ahmed Hegazi then also nodded in from a corner to put the visitors ahead before half-time. Swansea poured forward in search of a second-half equaliser but the Baggies held on to climb up to fourth. Darren Moore's men are now just two points adrift of the automatic promotion places. For the Swans, however, a third defeat from four matches sees them slip to 11th place. 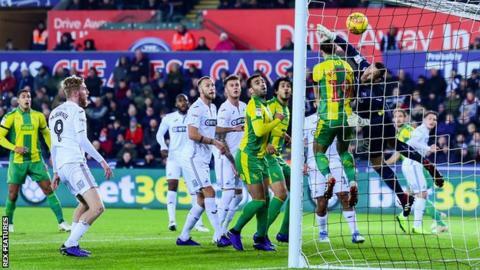 Whereas West Brom had responded to a winless run of four games with back-to-back victories, Swansea would have been forgiven for feeling a little fragile after they were beaten 4-1 at home by leaders Norwich City on Saturday. Such is the unpredictability of the Championship, however, they made a strident start to this encounter and took a deserved early lead. One of their stylish passing moves saw Matt Grimes play a one-two with McBurnie and, after Grimes' shot was saved by Sam Johnstone, McBurnie was on hand to power in the rebound. Swansea were brimming with confidence in the early exchanges, with Bersant Celina threading intricate through balls for the likes of Daniel James to run into promising positions. West Brom took a more direct route towards goal and it paid dividends, as a long, floating corner beyond the back post was met by Dawson, whose header looped into the opposite corner. Although the hosts continued to cut through the Baggies' high defensive line - with James wasting one particularly good chance - it was the visitors who struck next. Again, it was from a corner arcing towards the back post, where Hegazi rose almost unopposed to nod in. While two headed goals from centre-backs will have delighted West Brom's boss and former defender Moore, they will have been a cause for concern for Swansea, whose goalkeeper Erwin Mulder was found wanting on both occasions. The home side intensified their search for an equaliser as they approached the second half in gung-ho fashion, bringing on wingers Jefferson Montero and Barrie McKay as well as striker Wilfried Bony. Although Montero supplied several inviting crosses from the left flank, genuine scoring opportunities were scarce. And as Swansea threw bodies forward with abandon, that left them defensively exposed. West Brom's Harvey Barnes, who had a quiet evening by his high standards, came to life in the 72nd minute with a curling 20-yard shot which hit the post. But that mattered little as the Baggies - a little ruffled early in the first half but solid in the second - defended resolutely to see off Swansea's hopes of a revival and secure a well-earned win. "The effort was there - we put everything into the game. We lacked something in the final third in the second half but, while we're disappointed with the result, there are large aspects of the performance that were pleasing. "It's hard to be really pleased after a loss, but I think there's a lot to go forward with. "We now have to focus on regrouping, putting the disappointment behind us and trying to go to Derby [on Saturday] in a positive frame of mind." "It was a hard fought win today, I thought we found a way to come down here tonight that asked questions of the opponents, and we had to find a way to win through set pieces. "To score with set plays you need the right delivery, the right timing of runs and the right contact, and we got those right tonight which led to our two goals. "It's the third win in a row, but I thought tonight we played against a dynamic side and the key tonight was the quick response to their goal, it gave us a foothold in the game. "The Championship is littered with quality teams, it's an exciting division, and that will continue until the end of the season, so I'm not looking at the league table at the moment." Match ends, Swansea City 1, West Bromwich Albion 2. Second Half ends, Swansea City 1, West Bromwich Albion 2. Substitution, West Bromwich Albion. Gareth Barry replaces Hal Robson-Kanu. Corner, Swansea City. Conceded by Dwight Gayle. Attempt blocked. Oliver McBurnie (Swansea City) header from the centre of the box is blocked. Assisted by Martin Olsson with a cross. Attempt saved. Hal Robson-Kanu (West Bromwich Albion) header from the centre of the box is saved in the bottom right corner. Assisted by Kieran Gibbs with a cross. Substitution, West Bromwich Albion. Dwight Gayle replaces Harvey Barnes. Corner, Swansea City. Conceded by Craig Dawson. Attempt blocked. Joe Rodon (Swansea City) header from the left side of the six yard box is blocked. Assisted by Matt Grimes with a cross. Attempt blocked. Joe Rodon (Swansea City) header from very close range is blocked. Assisted by Matt Grimes with a cross. Corner, Swansea City. Conceded by Hal Robson-Kanu. Barrie McKay (Swansea City) wins a free kick in the attacking half. Attempt blocked. Wilfried Bony (Swansea City) left footed shot from the centre of the box is blocked. Assisted by Martin Olsson. Corner, Swansea City. Conceded by Ahmed Hegazi. Attempt missed. Matt Grimes (Swansea City) left footed shot from outside the box misses to the left following a corner. Corner, Swansea City. Conceded by Tosin Adarabioyo. Substitution, Swansea City. Wilfried Bony replaces Daniel James. Attempt missed. James Morrison (West Bromwich Albion) right footed shot from outside the box misses to the left. Harvey Barnes (West Bromwich Albion) hits the right post with a right footed shot from the left side of the box. Assisted by Craig Dawson. Substitution, Swansea City. Jefferson Montero replaces Leroy Fer. Attempt missed. Daniel James (Swansea City) left footed shot from a difficult angle and long range on the left is close, but misses to the left. Assisted by Joe Rodon. (West Bromwich Albion) wins a free kick in the attacking half. Daniel James (Swansea City) is shown the yellow card. Attempt missed. Bersant Celina (Swansea City) right footed shot from outside the box misses to the left. Attempt blocked. Bersant Celina (Swansea City) right footed shot from outside the box is blocked. Assisted by Daniel James.